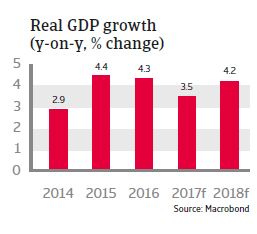 GDP growth will decrease in 2017 as sharp inflation increase restrains consumer demand, but in the medium-term the economy should benefit from reforms. Currently President Sisi is firmly in control of political power, while the military government is further tightening its grip on the country. That said, Sisi’s popularity has declined due to recent economic reforms, which resulted in a sharp increase in inflation (see below). The internal security situation remains tense, as the military crackdown in July 2013 has pushed the Muslim Brotherhood underground, risking further radicalisation of some elements. In the Sinai Peninsula and the border region to Libya Jihadist forces are stirring unrest. The largest of those groups is the so-called “Sinai Province”, an affiliate of the Islamic State. In April 2017 there were large-scale attacks on Coptic Churches (for which IS claimed responsibility), leading to the declaration of a state of emergency. 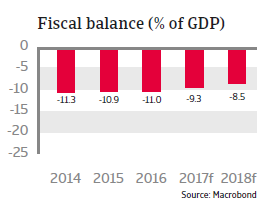 Egypt´s economic problems mounted in 2015 and 2016, with a very high budget deficit of about 11%, low levels of foreign exchange, shortages of USD and a large financing requirement. In November 2016 the government finally accepted an IMF programme with a three-year facility of USD 12 billion in order to obtain much-needed external financial support. The main objectives of the programme are a flexible exchange rate, fiscal consolidation and introduction of structural reforms. In addition to the IMF other multilateral institutions (e.g. G7) and countries (e.g. Saudi Arabia and the United Arab Emirates) provide additional financial support. As a precondition to obtaining IMF support Egypt had to float the fixed exchange rate, raise taxes and reduce subsidies on electricity and fuel. The Egyptian pound depreciated sharply (about 50%) in the first days after the float in November 2016. In order to support the currency and to curb inflation, the central bank raised the benchmark interest rate by 300 basis points to 14.75%. While the currency depreciation has improved external competitiveness, it has also triggered higher inflation, forecast to reach 22.5% in 2017, as prices for imports have increased sharply. Subsidy cuts have added additional pressure on consumer prices. 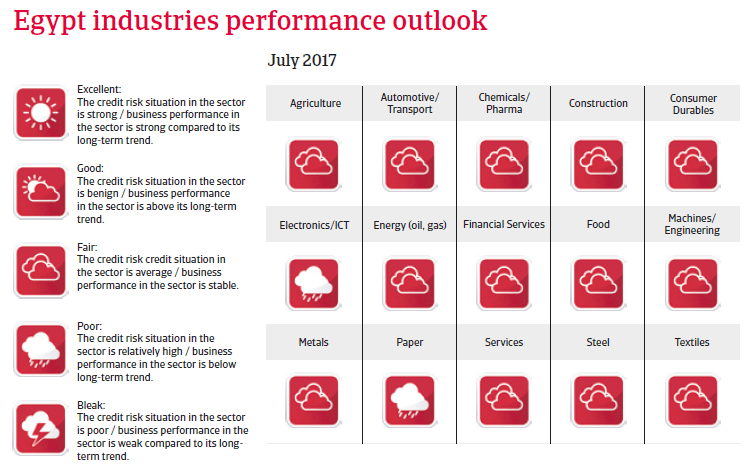 Economic growth is expected to decrease in 2017 as the sharp inflation increase will restrain consumer demand. However, despite the painful effect of rising prices for consumers, in the medium-term the economy should benefit from the IMF-programme related measures. Most important is the easing of the chronic USD currency reserves shortage. 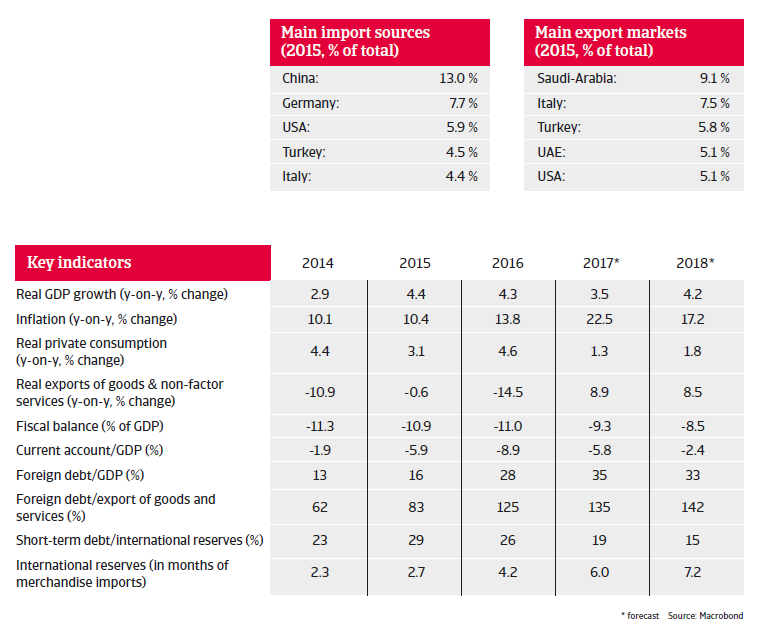 Additionally, exports should benefit from the currency depreciation while tourism is expected to recover further (although still remaining vulnerable to terrorist attacks). Investor sentiment has already improved and private capital inflows have increased. With a floating currency Egypt is able to absorb external shocks better. The external financing requirement is still high (2016: 91% of reserves) but declining. Foreign debt has increased, but remains at acceptable levels (35% of GDP in 2017). 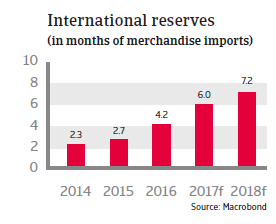 Due to the large external financial assistance international reserves are increasing, resulting in a higher import cover of 6 months in 2017. Government finances remain the main soft point. Although the budget deficit is decreasing, it remains high at 9.3% of GDP in 2017. Fiscal consolidation is an important target in the IMF programme, necessary to keep the high public debt of about 95% of GDP sustainable. At least this debt is mainly domestically financed, limiting the exchange rate risk. While further tax increases and subsidy cuts are necessary to improve public finances, implementing them could prove politically difficult, as a large part of public spending is still geared towards maintaining social stability. In the medium-term, Egypt´s economic outlook seems to be more positive due to the discovery of large offshore gas fields. Increasing domestic gas production should improve electricity supply and support economic activity in coming years.